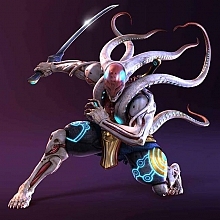 I'm looking for creative person, a Soul Calibur Yoshimitsu fan, who's willing to spend his/her time on gathering information about him to be published in Soul Calibur section. 1. All paths in Yoshimitsu's SC3 storyline, together with all written in the game story parts and screenshots of a map if possible. Also, if possible, all movies of storyline cutscenes. I want to create a html-formatted tree of Yoshimitsu's Storyline. I don't think I can provide much home-made screenshots and movies, though: I still have a pirated version of SC3 (Yes, I'm ashamed of myself), which doesnt work with my capture card..
You can start gathering info and media for me, and as you'll be ready, send it to me via email or just post in this thread that you have something. ^^ Bringing back SC section is essential, the history and roots of Manji Clan are important, don't you think? How about sending you my TV tuner? I can try to get you all Yoshimitsu's storyline in SC3 for I have spring break next week and I have not played my SC3 game for a while. I got most of them. May need to practice some with my digtal cam about flimming the movies for you but I can try and I will let you know if something comes up. If you have any questions you can catch me on MSn Messnager or Yahoo Messanger. My Msn Messanger named is manji_phoenix@hotmail.com and my Yahoo Messnager is manji_michiko@yahoo.com. I like the idea. What happened. Where is everyone.